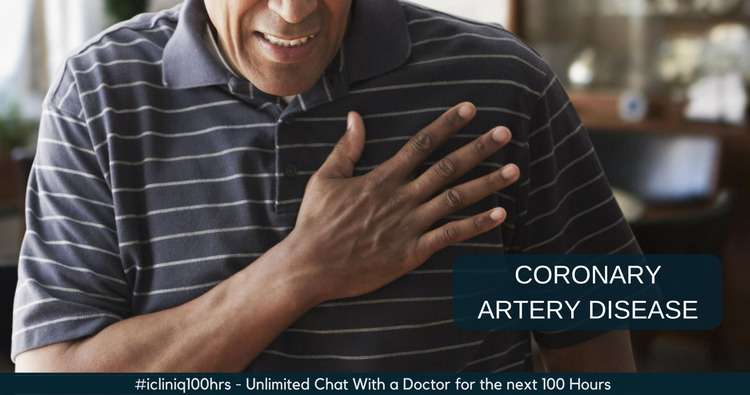 Coronary artery disease is characterized by blockages in the arteries, which supply blood to the heart. This, in turn, will cause nutrition and oxygen deprivement of the heart, which leads to pain and damage to the heart muscle. Heart dysfunction leads to symptoms or heart attack. There are two presentations of coronary artery disease. They are stable disease or heart attack. Patients usually complain of chest pain which occurs on activities, retrosternal in origin and the pain also goes to the left arm, back and jaw. Many people may have a heart attack as the first presentation. Heart attack pain may be of similar nature, but of severe intensity and associated with sweating, shortness of breath, syncope or death. That is why it is so important to know how to spot a heart attack. Pain and pressure or discomfort in the center of the chest usually on the left side. Pain, tingling or discomfort in other parts of the upper body, including the arms, back, neck, jaw or stomach. Nausea, vomiting, burping or heartburn, which can be confused with acidity problem. Sweating or having cold and clammy skin due to low blood pressure. Abnormal awareness of one's heartbeat. If the above symptoms persist for more than 10 minutes or if they recur, then call for help right away. I was diagnosed with AFib . Should I be on beta blocker? An electrocardiogram (ECG or EKG) - Detects abnormal electrical changes in your heart. A stress test - If your resting ECG is normal, then the physician may give a bit of stress to your heart like asking the patient to run or give a medicine, which will increase the heartbeat and under these stressful conditions heart may show abnormal electrical activity and heart disease can be diagnosed. An echocardiogram - This test with the help of sound waves creates an image of beating heart and gives the information regarding the function of the heart. Functioning of the heart is mentioned in the term called as ejection fraction, and the normal value is more than 55%. Cardiac catheterization or angiography - During this test, the doctor inserts a thin pipe into a blood vessel in the leg groin area or the arm near the wrist. This tube is inserted till heart, and then the medicine is injected, which is called as dye with the help of which heart blood vessels are visualized. Exact site, number and percentage of blockages can be known from this test. This is the final and the best test for detecting block. However, this is expensive and has a risk of bleeding and other complications. The various options available are lifestyle modifications and medications. If blockages are critical, then the patient may need a procedure to open the blocks, which can either be a stent or bypass surgery. Should eat plenty of fruits and vegetables and low-fat products. Avoid meat, oily food and quit smoking. Do regular exercise and lose weight if overweight. Medicines are the most important part of the treatment. This should be consumed as advised and without default. Medicines called statins, which lower the cholesterol should be consumed even if cholesterol is normal. Blood pressure lowering medicines and blood thinners like Aspirin and Clopidogrel are very important. Other medicines like beta blockers and nitrates help the patients with chest pain. A stent procedure is also called as angioplasty. During this procedure, the doctor puts a thin pipe in the blocked artery and dilates it with a balloon. Also, keeps the stent in the vessel to hold the artery in open state. It is very important that patients do not default the medicines after stenting. Otherwise, the risk of stent blockages is very high. Bypass surgery also called as coronary artery bypass grafting or CABG. During bypass surgery, the doctor uses another vessel, which may be from the chest or sometimes legs. Doctors connect this vessel above and below the blockage and bypass the blockage. This vessel is called as a graft. Depending upon the number of grafts, the patient is labelled as a double or triple bypass. The bypass surgery is a lengthy and high-risk procedure. It is usually done in individuals having blockages in three or more vessels or blockages in the main artery. Do you have a question on Heart Attack or Coronary Artery Disease?